Bullseye is one of the events in the Hyperflite Skyhoundz DiscDogathon Championships (DiscDogathon Qualifiers, DiscDogathon International Qualifiers, DiscDogathon European Championship, and the DiscDogathon World Championship). 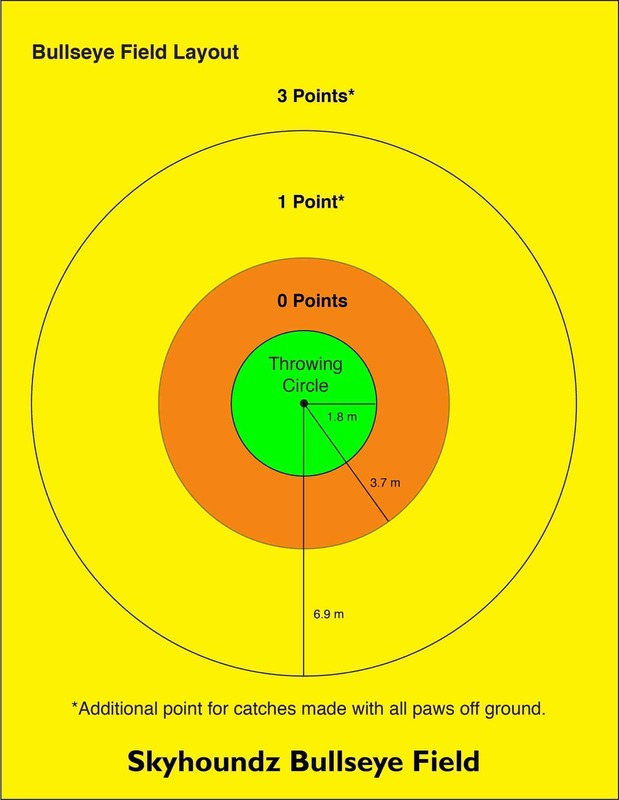 Bullseye is a fast-paced and updated derivation of the original circular canine disc distance format. To give you an idea of what Skyhoundz Bullseye looks like, here is a video of Rick Nielson and Jessie at Academy Dog Sports in Alpharetta, Georgia. An open, flat, grassy area free of obstacles with concentric 4, 8, and 15 yard (3.7, 7.3, and 13.7 meter) diameter circles. (Please note: For field layout, the graphic above depics 2, 4, and 7.5 yard (1.8, 3.7, and 6.9 meter) radiuses. Scoring zones and field dimensions are depicted in the graphic above (click to enlarge). Teams may use two discs to complete throws in any direction. The thrower and the canine must be within the throwing circle before time commences. Thereafter, the thrower and canine may move freely about the field to catch and/or retrieve discs. All throws must be made from within the throwing circle. Scoring is as depicted in the graphic. Competitors receive one minute to score as many points as they can. 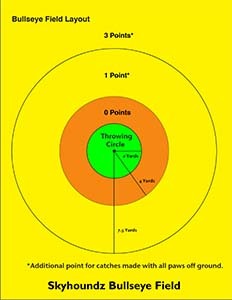 The thrower and canine are required to be in the throwing circle before time starts. The line judge will ask the competitor, "Ready?" When the competitor responds yes, the line judge will raise his/her arm. The announcer will then say, "Go!" and the time will begin. If, in the opinion of the line judge, the dog leaves before time begins, the line judge will signal to the announcer, time will be reset to zero, and a restart will be initiated. Competitors may send their canines downfield, or throw, anytime after the start signal is sounded.